We were approached by Overbury because they needed to install a wheelchair platform lift during the fit out and refurbishment of Telefónica Digital's new HQ in Piccadilly. Overbury were responsible for redesigning and redeveloping the office space totalling 50,000 sq ft offering new and improved workspaces as well as meeting rooms and an inverted cone "brand pod." During the fit out, Overbury needed to fit a lift to allow access form 9th floor elevators to the staff meeting areas as well as the project workspace. The client wanted a lift that would match the office's new design and blend into the surrounding aesthetics with the fit out being very light with large open spaces. The designer decided to choose a white wheelchair platform lift with glass panels on the lift car itself so that the lift's style and finish matched that of the rest of the office. The platform of the lift measures 1400mm x 1100mm and has a total travel distance of 1370mm across 6 stairs. The wheelchair platform lift is capable of taking a load of up to 410kg, which means it can be used by both electric-powered buggy users and regular wheelchair users. 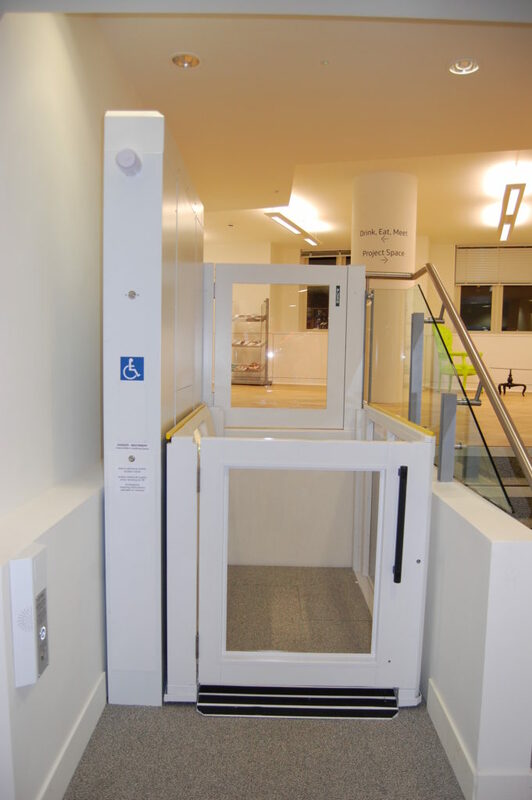 The lift provides access from the elevators on 9th floor to the staff meeting areas as well as the project space and provides vital access for any disabled visitors. 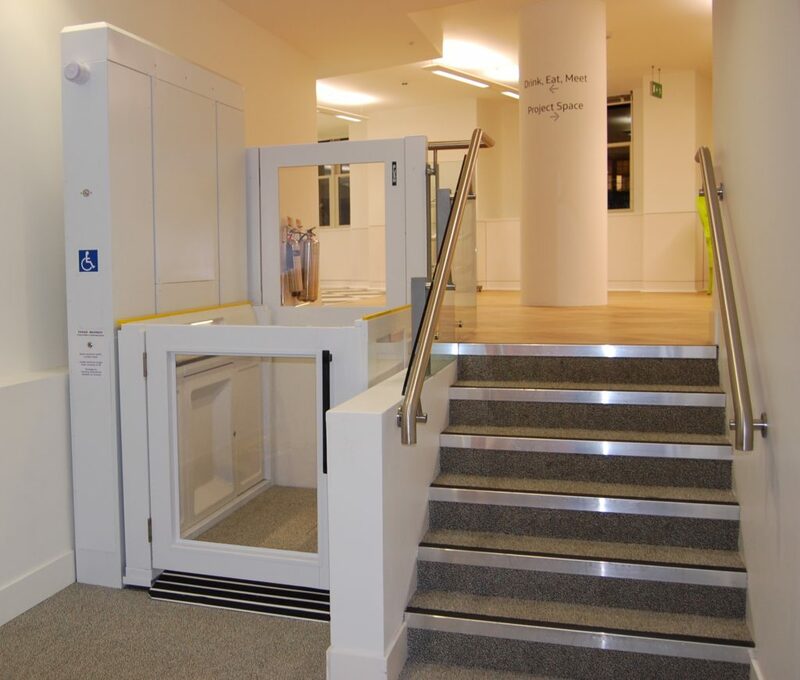 To see more of our wheelchair platform lifts in commercial buildings and offices click on the following projects: Grade II listed Waterworks, Venture House in Reading, Office Fit Out in Seven Dials and Southwark Council. 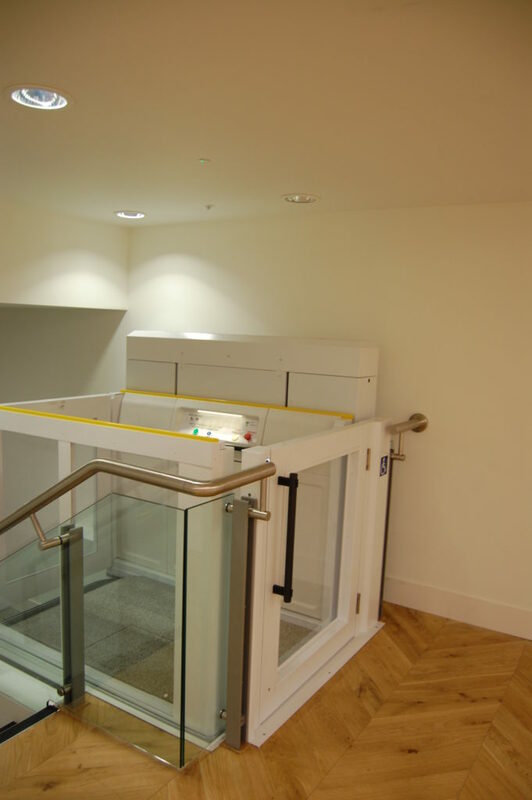 To see more of our lifts in commercial and public buildings click on the following projects: Meriden Hall, British Library, New Forest Ice Cream and Paternoster Square. Posted in Commercial Buildings, Projects.